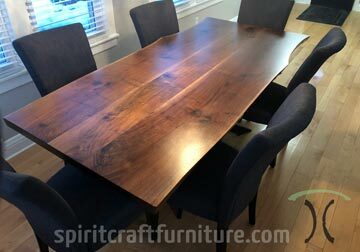 We specialize in tables and tops from solid hardwood live edge slabs and wide planks that make wonderful cocktail, dining & conference room tables, kitchen islands and desk tops. 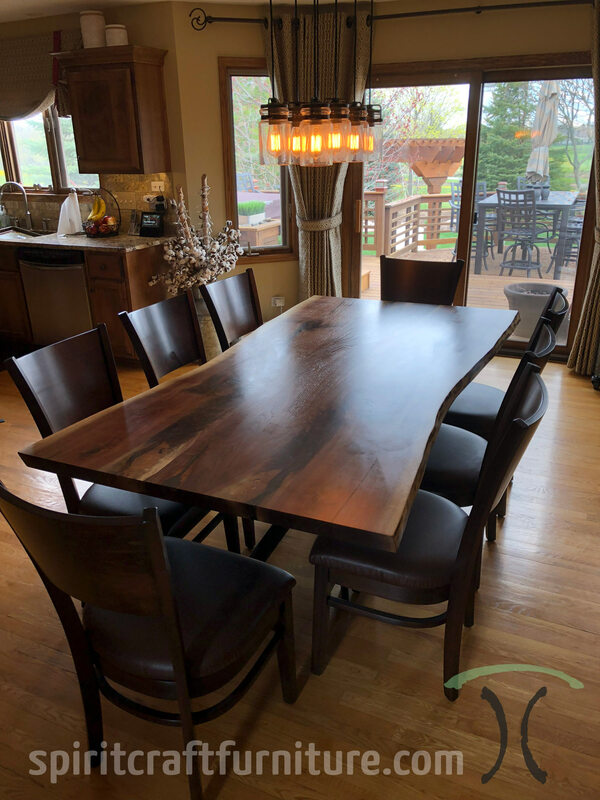 We also offer custom table tops and blanks to fellow woodworkers and cabinetmakers, DIY home decor enthusiasts and for commercial, restaurant and library installations. 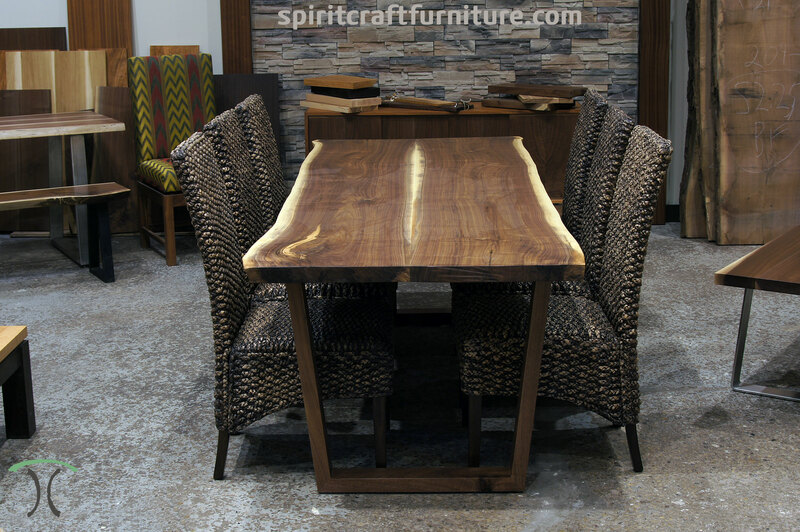 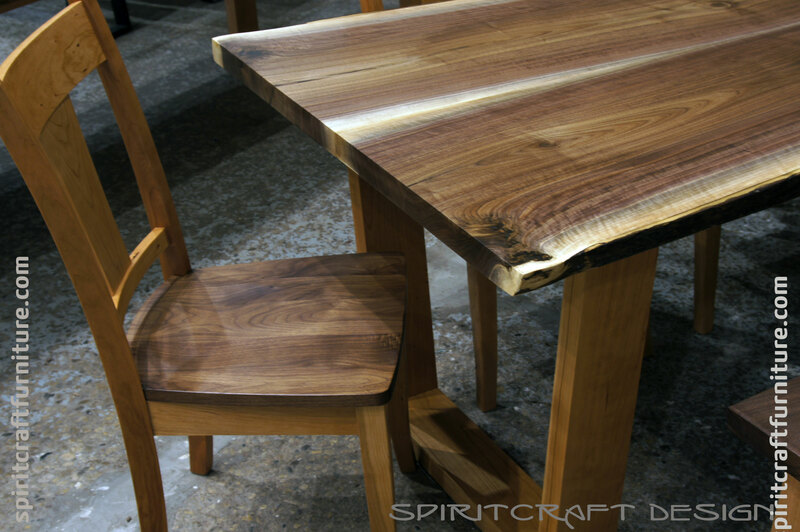 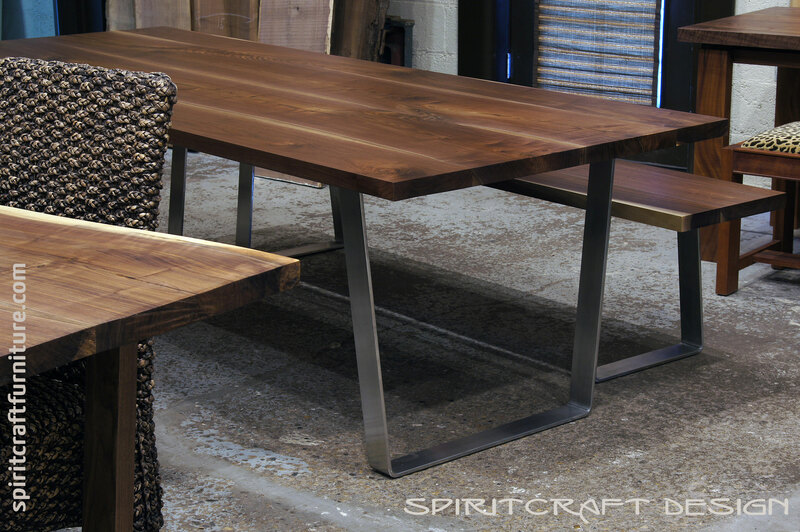 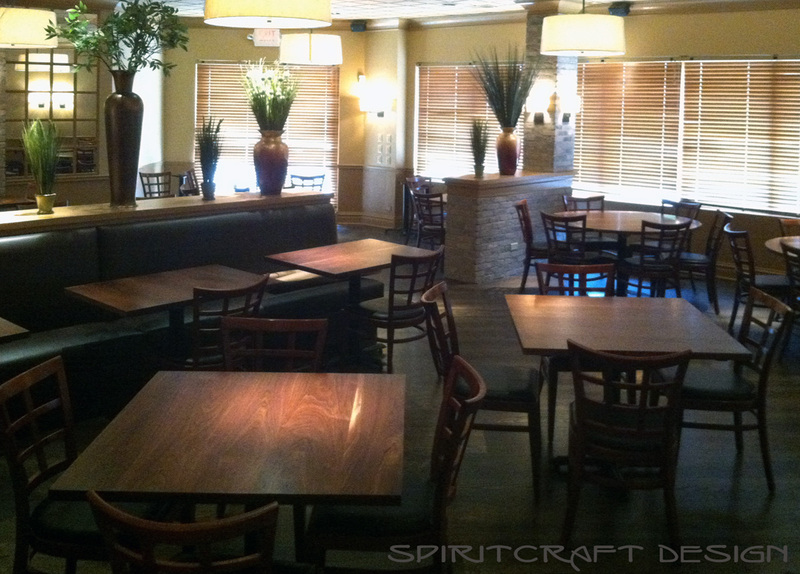 Our custom made table tops are crafted by Spiritcraft Furniture , a division of GSHW, to endure generations in hardwoods that are of the highest quality. 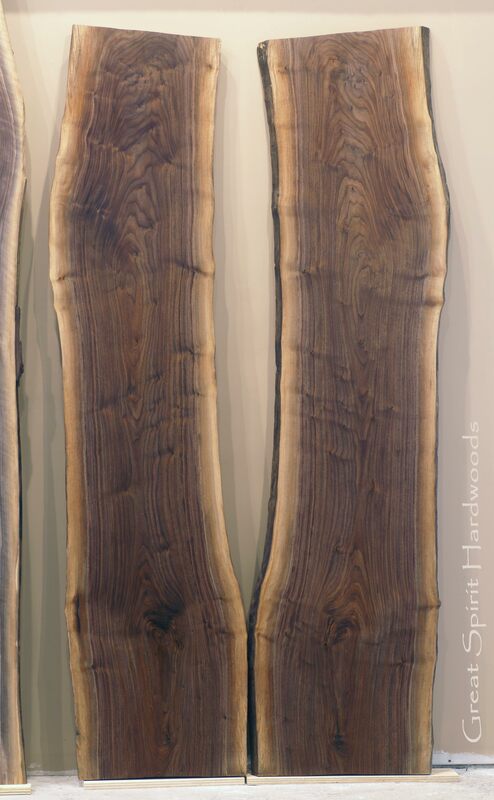 Our domestic rough or finished live edge hardwood slabs are taken from large rescued dying, storm downed and otherwise fallen trees and then carefully kiln dried in our dehumidification kiln. 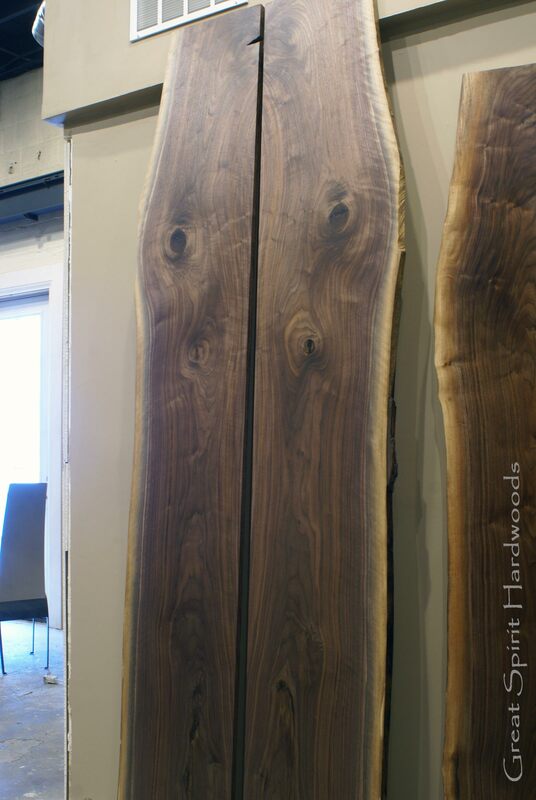 Our live edge slabs in Black Walnut and other species: We specialize in solid hardwood live edge slabs in many domestic species including Walnut, Cherry, Ash, Maple, Sycamore, Elm, Honey Locust and more. 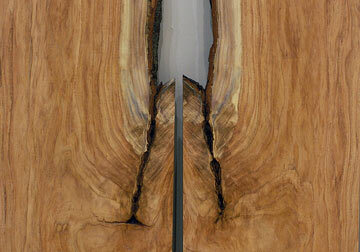 Live Edge Slabs are "in" and our kiln dried slabs will provide a dramatic centerpiece to any room. 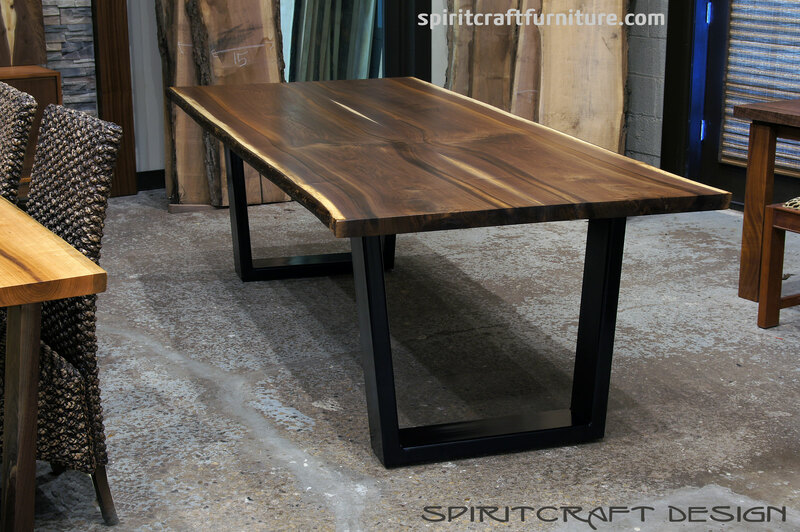 Interior and kitchen designers, woodworkers and home decor retailers resell our beautiful kiln dried slab and live edge tables and table tops but we do sell directly to the public through our table and furniture showroom adjacent to Great Spirit Hardwoods. 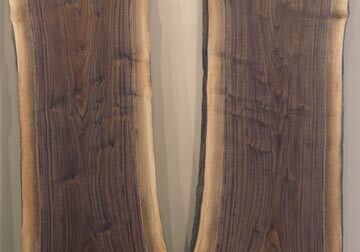 Our live edge slabs are unique and while some still have the bark attached, others exhibit a wonderful natural clean edge of sapwood like that made famous in the work of George Nakashima. 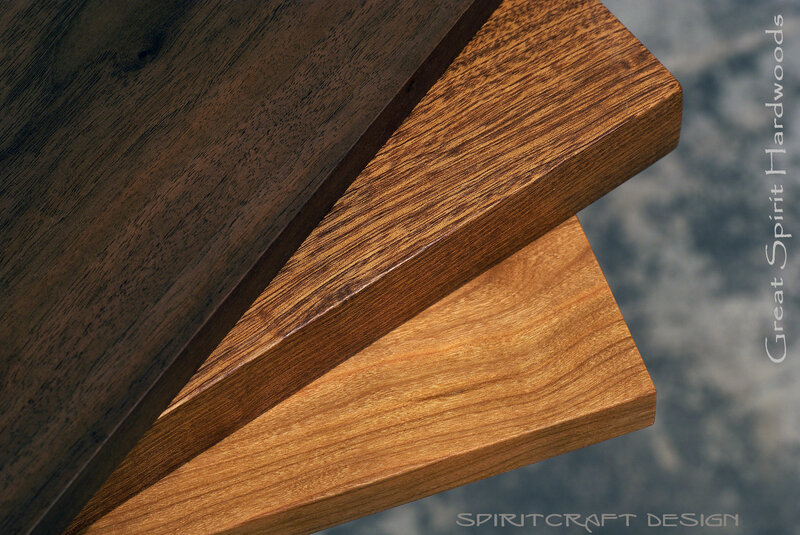 Our domestic hardwood slabs are taken from large rescued storm downed rural and urban trees and have the wonderful color and grain found only in the hardwood of larger trees. 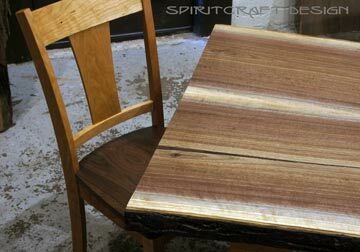 We also make tables and table tops in nearly any non endangered hardwood in any size and thickness. See SpiritcraftFurniture.com for more info and for images of our handcrafted live edge tables and slab tops. 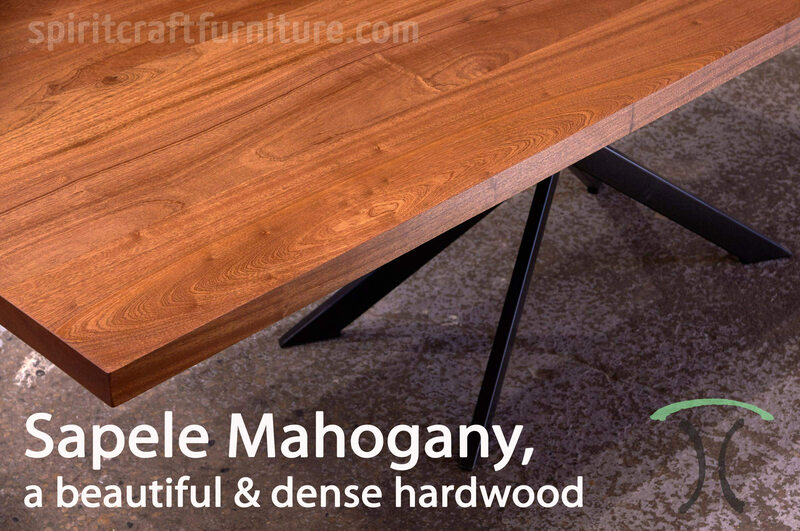 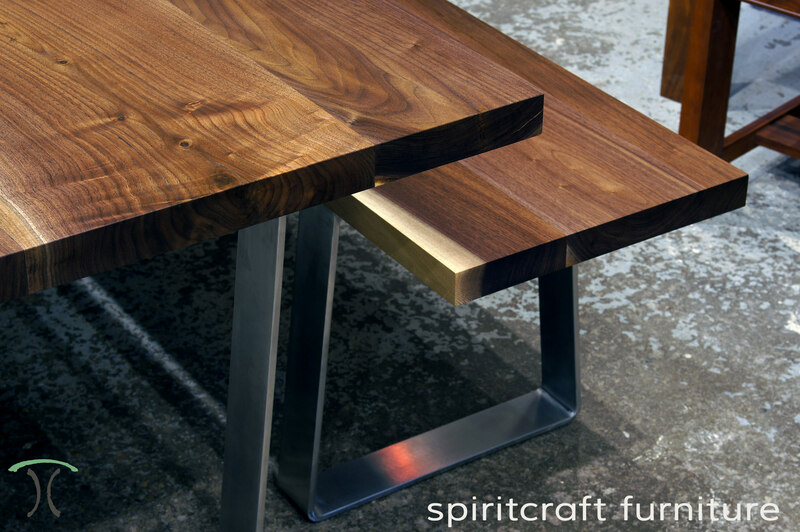 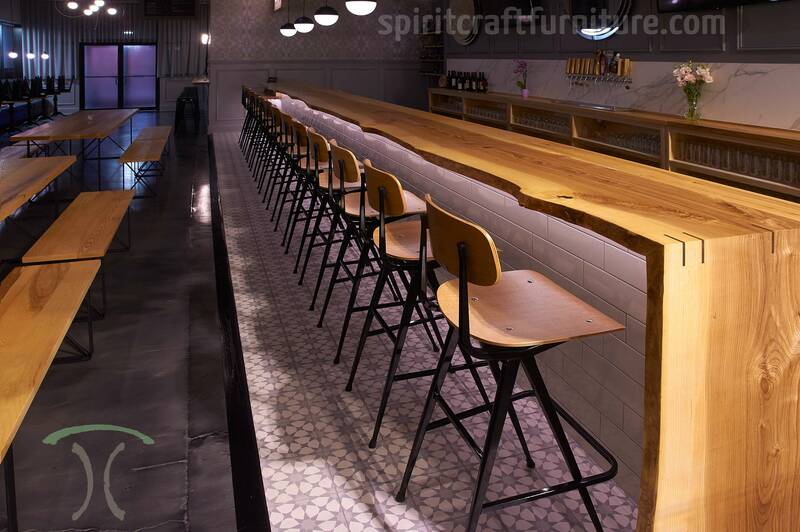 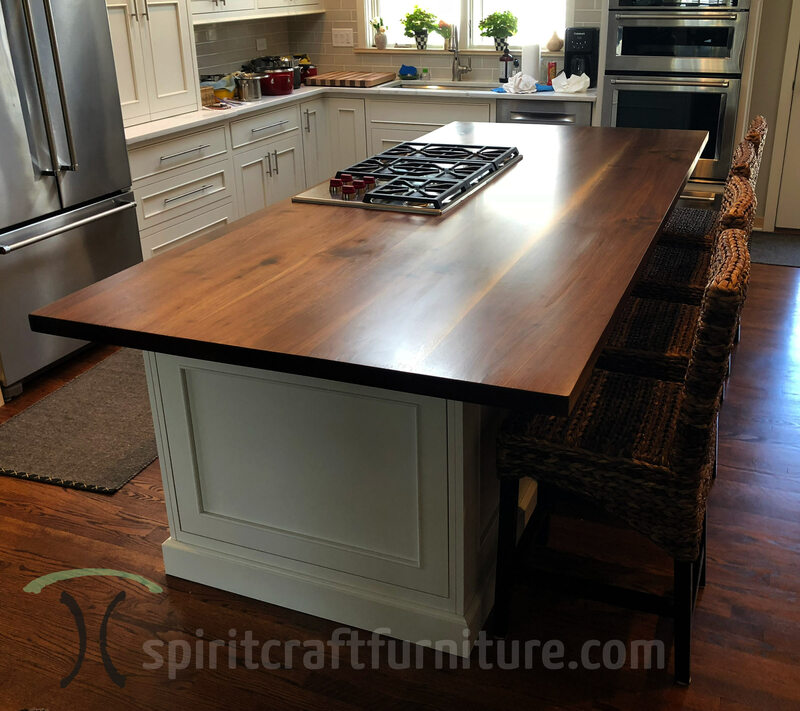 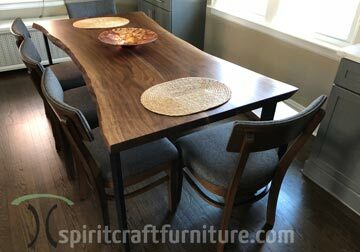 We at Great Spirit Hardwoods and Spiritcraft Furniture, as furniture designers & craftspersons and purveyors of select hardwoods we have the experience, knowledge and foresight to provide clients with the finest tables and tops from both live edge and hardwood lumber. 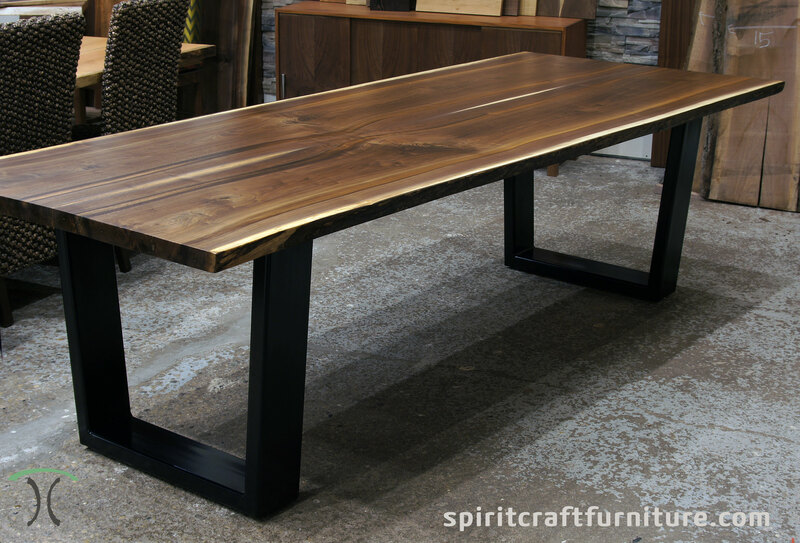 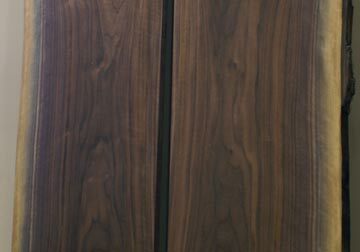 We specialize in Black Walnut live edge slabs and this beautiful hardwood is never steamed and thus exhibits the color and palette of hues that the "Great Spirit" intended. 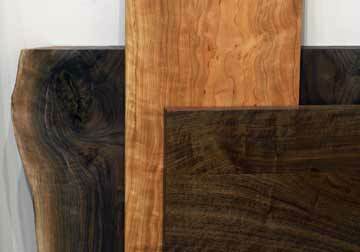 Every slab is carefully kiln dried to ensure generational endurance and heirloom quality. 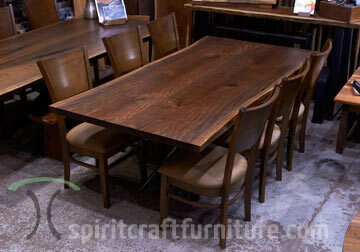 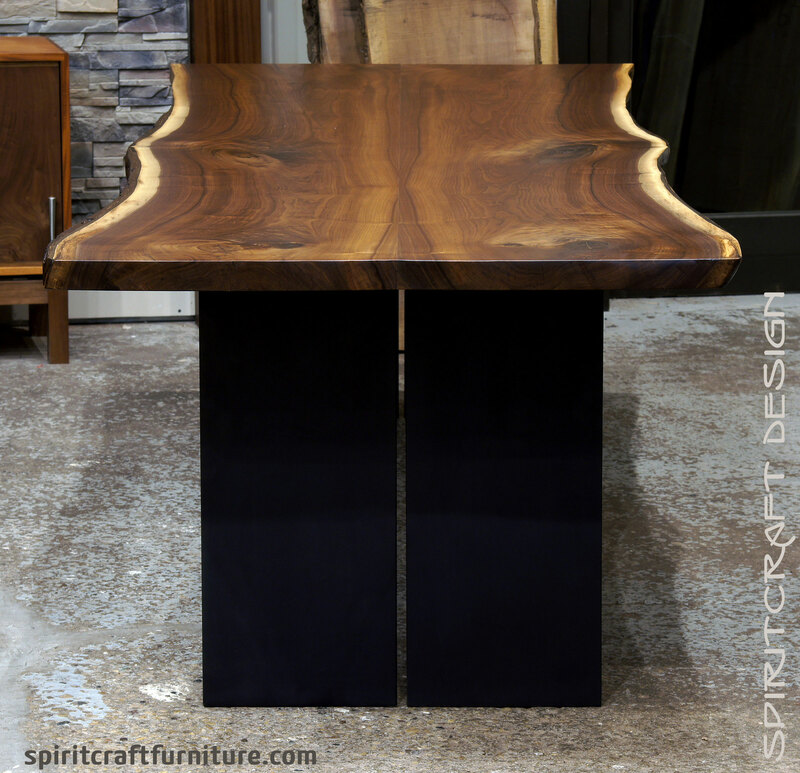 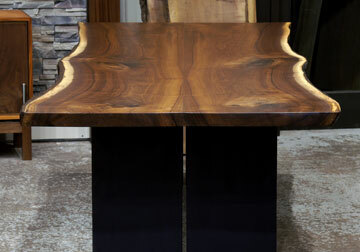 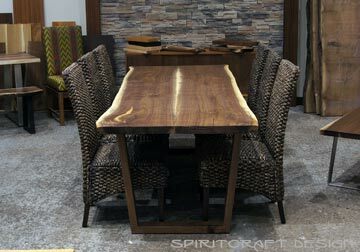 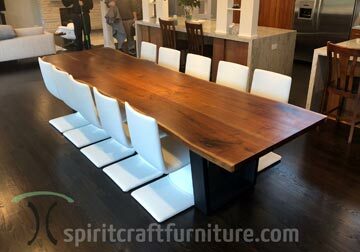 Visit spiritcraftfurniture.com for more information on our live edge dining table, island, bar and desk tops. 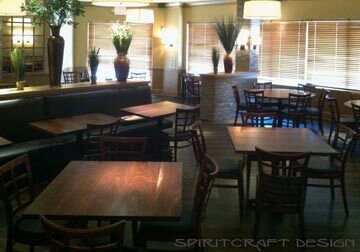 Custom Hardwood Table Tops: We offer solid hardwood table tops in a variety of species and in nearly any size imaginable. 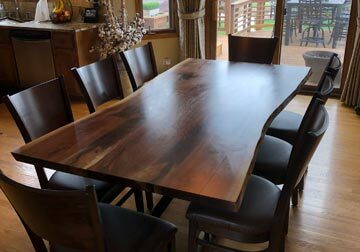 Our table tops are made from wider boards than what is commercially available and the hardwoods are of a finer grade than most of the competition. Our larger, industrial equipment allows us to make machine flat tops from fewer select wide boards rather than a glued up top consisting of what amounts to sticks. 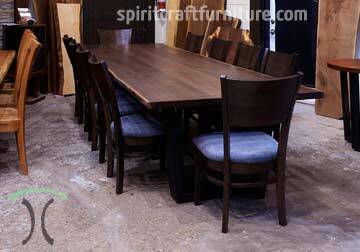 We offer our table tops to fellow woodworkers, home decor enthusiasts, interior and kitchen designers, and for commercial, office and restaurant owners. 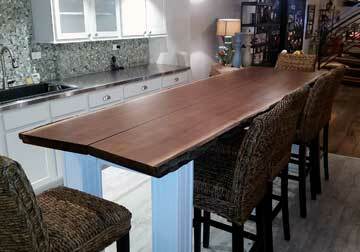 DIY clients also find our tops the perfect solution for a restored or repurposed base. 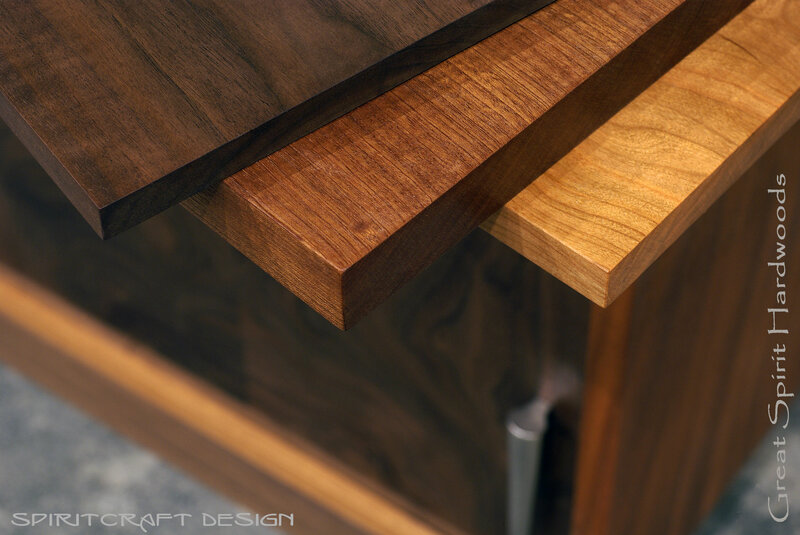 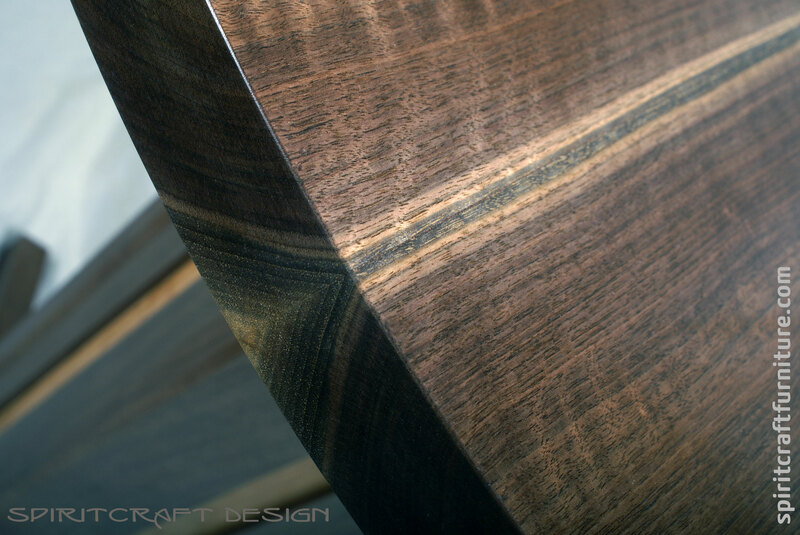 We craft tops in Walnut, Cherry, Ash, Hard Maple, Sycamore, Sapele, African Mahogany, Hickory and other exotic and domestic species. 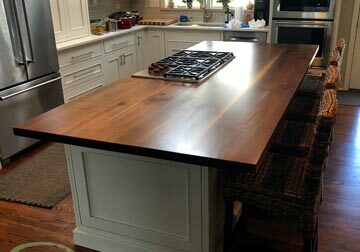 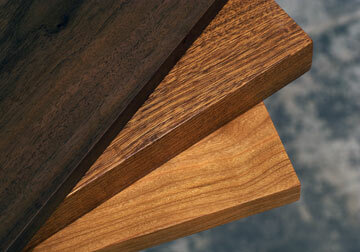 Table tops can be finished using our time tested proprietary finish or be sanded to allow finishing by the client. 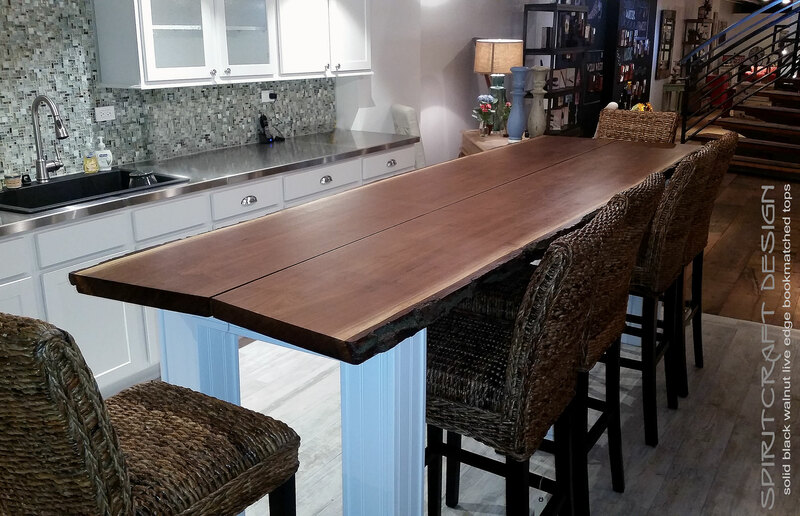 We will custom stain hardwoods such as Sapele and African Mahogany as their characteristics allow for beautiful and even staining. 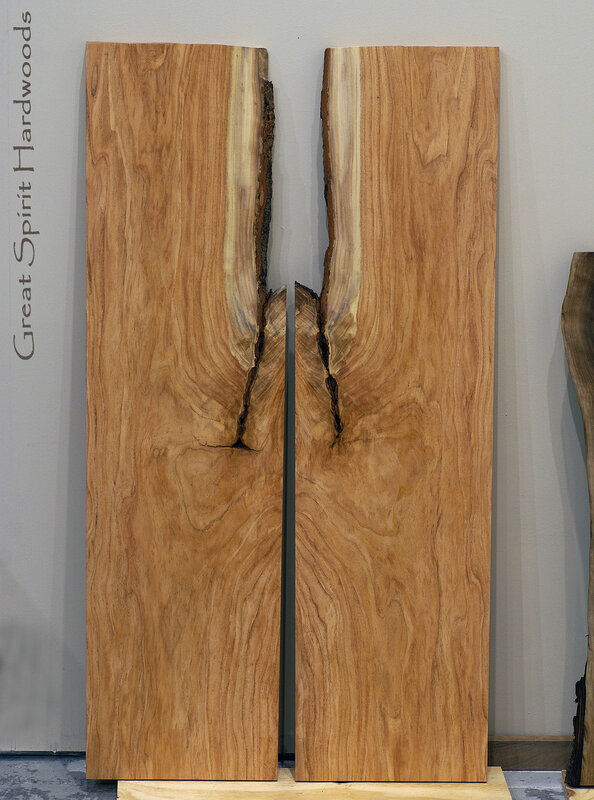 We ship our tops nationally, but local clients can pick their hardwood boards from our selection of fine kiln dried hardwoods within Great Spirit Hardwoods, our retail hardwood store. 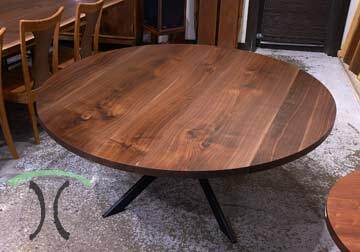 Our tops are used for dining, cocktail and occasional tables and for desk tops, conference tables and kitchen islands & counters. 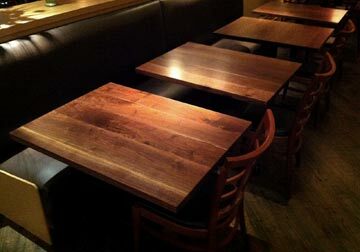 Whether you need a single table top or dozens, we might be just what you have been looking for. 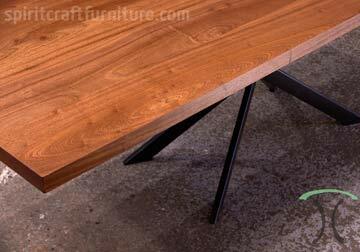 Our custom hardwood table tops are crafted from quality wide boards, are "machine flat" and available finish sanded or finished. 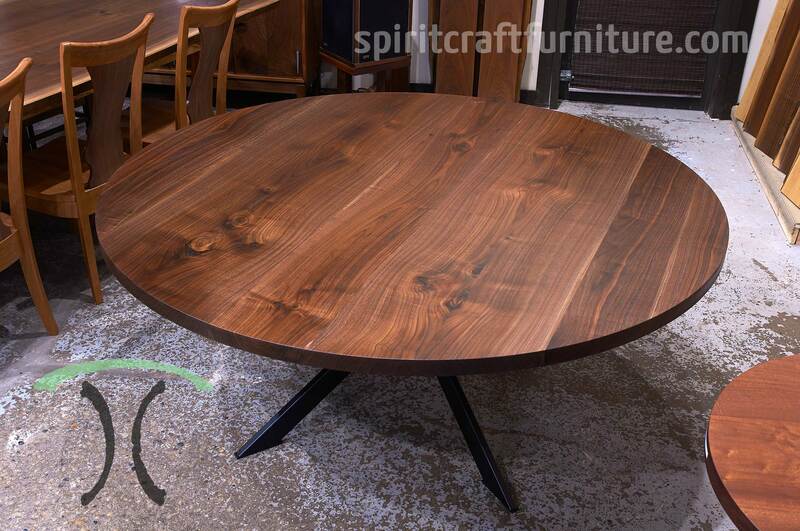 Custom Made Round Walnut Table Top for Cafe Tables in Chicago Bistro, Beautiful and Natural, Easy Maintenance Finish. 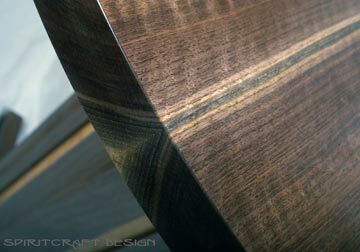 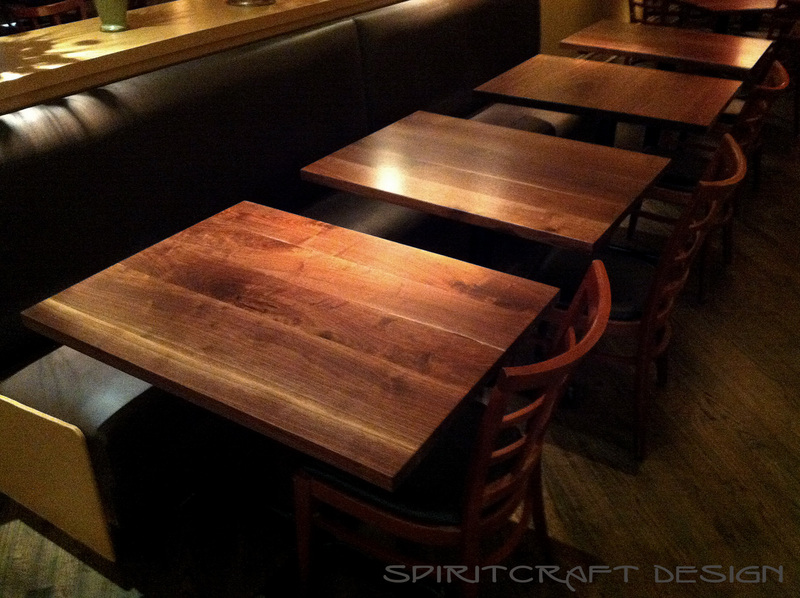 Solid Hardwood Black Walnut Table Tops at Chicago Restaurant, Custom Made in any Size and Shape. 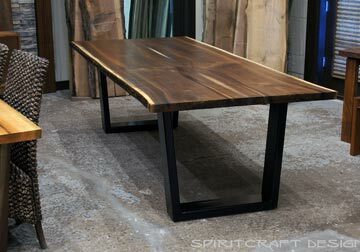 Visit spiritcraftfurniture.com/custom-hardwood-table-tops for more information on our custom made table, island, bar and desk tops, stair treads, hardwood panels and other solid surfaces.